The input storage class defines the external variable. The input modifier is indicated before the data type. A variable with the input modifier can't be changed inside mql4-programs, such variables can be accessed for reading only. Values of input variables can be changed only by a user from the program properties window. External variables are always reinitialized immediately before the OnInit() is called. Input variables determine the input parameters of a program. They are available from the Properties window of a program. There is another way to set how your input parameter will look like in the Inputs tab. For this, place a string comment after the description of an input parameter in the same line. In this way you can make names of input parameters more understandable for users. Note: Arrays and variables of complex types can't act as input variables. Note: The length of a string comment for Input variables cannot exceed 63 characters. Custom Indicators are called using the iCustom() function. After the name of the custom indicator, parameters should go in a strict accordance with the declaration of input variables of this custom indicator. If indicated parameters are less than input variables declared in the called custom indicator, the missing parameters are filled with values specified during the declaration of variables. If the custom indicator uses the OnCalculate function of the first type (i.e., the indicator is calculated using the same array of data), then one of ENUM_APPLIED_PRICE values or handle of another indicator should be used as the last parameter when calling such a custom indicator. All parameters corresponding to input variables must be clearly indicated. Not only built-in enumerations provided in MQL4, but also user defined variables can be used as input variables (input parameters for mql4 programs). For example, we can create the dayOfWeek enumeration, describing days of the week, and use the input variable to specify a particular day of the week, not as a number, but in a more common way. In order to enable a user to select a necessary value from the properties window during the script startup, we use the preprocessor command #property script_show_inputs. 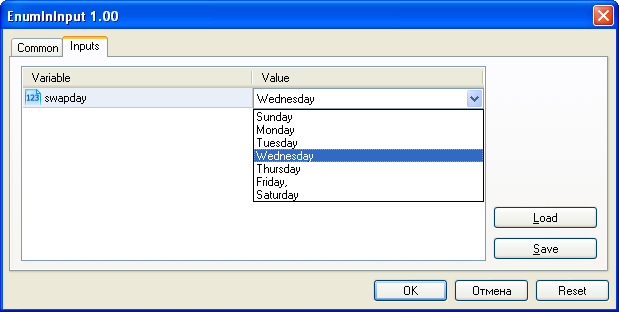 We start the script and can choose one of values of the dayOfWeek enumeration from the list. We start the EnumInInput script and go to the Inputs tab. By default, the value of swapday (day of triple swap charge) is Wednesday (W = 3), but we can specify any other value, and use this value to change the program operation. Number of possible values of an enumeration is limited. In order to select an input value the drop-down list is used. Mnemonic names of enumeration members are used for values displayed in the list. If a comment is associated with a mnemonic name, as shown in this example, the comment content is used instead of the mnemonic name. Each value of the dayOfWeek enumeration has its value from 0 to 6, but in the list of parameters, comments specified for each value will be shown. This provides additional flexibility for writing programs with clear descriptions of input parameters. Variables with input modifier allow not only setting external parameters values when launching programs but are also necessary when optimizing trading strategies in the Strategy Tester. Each input variable excluding the one of a string type can be used in optimization. The variable declared with sinput modifier is an input parameter of MQL4 program. The value of this parameter can be changed when launching the program. However, this variable is not used in the optimization of input parameters. In other words, its values are not enumerated when searching for the best set of parameters fitting a specified condition. The Expert Advisor shown above has 5 external parameters. "Number of layers" is declared to be sinput and equal to 6. 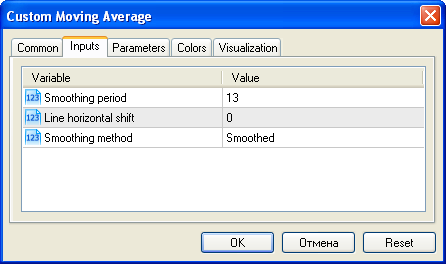 This parameter cannot be changed during a trading strategy optimization. We can specify the necessary value for it to be used further on. Start, Step and Stop fields are not available for such a variable. 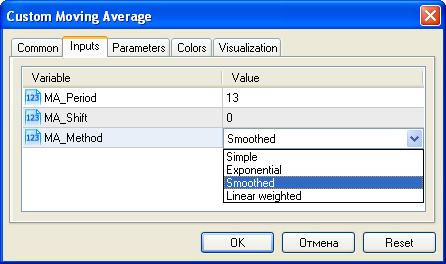 Therefore, users will not be able to optimize this parameter after we specify sinput modifier for the variable. In other words, the terminal users will not be able to set initial and final values for it in the Strategy Tester for automatic enumeration in the specified range during optimization. However, there is one exception to this rule: sinput variables can be varied in optimization tasks using ParameterSetRange() function. This function has been introduced specifically for the program control of available values sets for any input variable including the ones declared as static input (sinput). The ParameterGetInput() function allows to receive input variables values when optimization is launched (in OnTesterInit() handler) and to reset a change step value and a range, within which an optimized parameter values will be enumerated. In this way, combining the sinput modifier and two functions that work with input parameters, allows to create a flexible rules for setting optimization intervals of input parameters that depend on values of another input parameters.